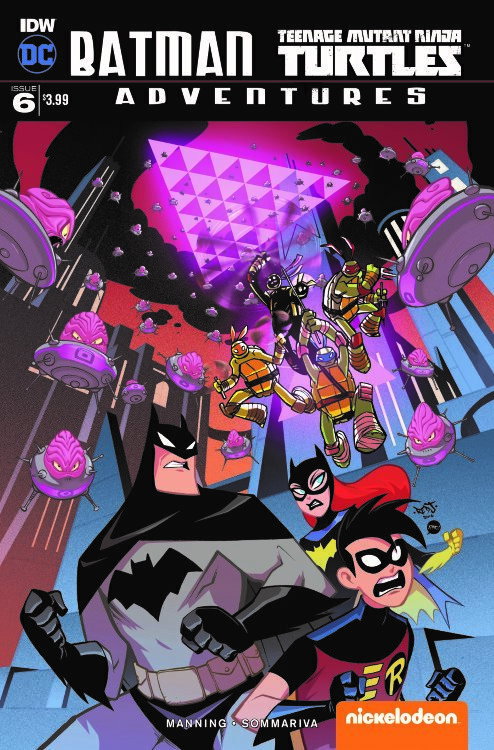 IDW continues it’s run with their Batman/TMNT animated universe mash-up. Our creators have allowed time to pass since the last story. Batman has added his new partner, Robin (Tim Drake), to his side. Wayne and Drake are attending a film festival in Gotham which ends up paralleling their actual adventures. The story has remnants of Scarecrow’s crossover into New York City and the Turtles dimension. Krang’s minions invade Gotham City causing mass hysteria and giving our heroes their day to save. Enter the Turtles who have tracked Krang’s baddies to Gotham. The situation adds to the relationship between Batman and the Turtles, but it also seems the writers are reaching to create a team-up. Overall the crossover continues to be fun. Batman and Turtles tend to work very well together as a team. The Turtles make a great joke about the new “little” Robin. If you need a nice distraction from the “down to earth” Batman/TMNT stories, this is the book for you.